Golf hazards like sand bunkers and lakes might ruin your day—but one hazard at Buffalo Creek Golf Course in Palmetto, Florida could end your life. A monstrous, dinosaur-sized alligator has been filmed strolling across Buffalo Creek golf course during an afternoon round of golf. Charles Helms, the man who recorded the now-viral video, brazenly filmed the carnivore from only a few yards away and posted it to his Facebook page. Strangely, the staff at Buffalo Creek Golf Club are not concerned about the gigantic predator. 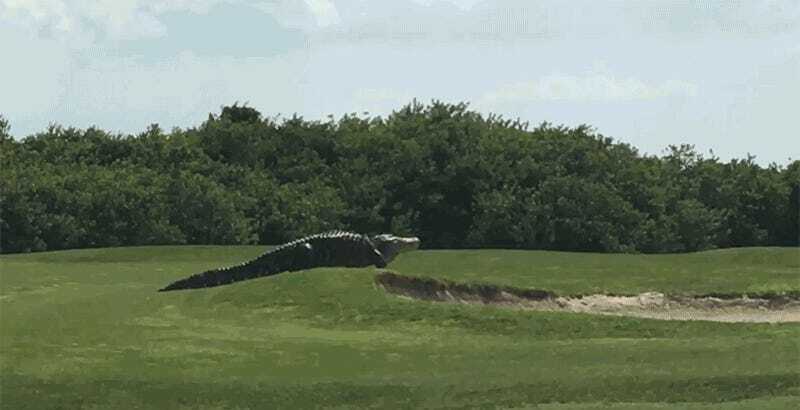 One of the golf course’s worker told local news reporters that the alligator is “like a mascot for the course.” Let’s just hope this mascot stays in a safe zone—far out of the field of play—from now on.